Abstract: The widespread use of mobile technology and access to Internet by disaster affected communities creates significant challenges and opportunities for the humanitarian system. Many humanitarian organisations are increasingly venturing into innovative ICT programmes and partnerships with technology providers. In this article, the authors capture their insights, lessons learned and recommendations from working across the ICT and Humanitarian nexus. This context has meant that many humanitarian organisations are increasingly venturing out to innovate outside of their core competencies, creating a need for partnerships to be developed between technology providers and more traditional humanitarian organisations. An example of this is the collaboration between the Digital Humanitarian Network and UN OCHA on crisis mapping. In this article we capture our insights, lessons learned and recommendations from working across the ICT and Humanitarian nexus that will be of use to others working on developing partnerships, and those who may be tasked with brokering such partnerships. The management consultant Peter Drucker is attributed with the quote “culture eats strategy for breakfast” to convey the power that culture has in organisations. Cultures and sub-cultures are prevalent in not only organisations, but across industries. 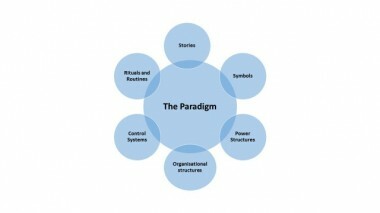 In their book on corporate strategy , Johnson, Scholes and Whittington (2011) identify the “cultural web” as a tool to explore these issues (see Diagram 1 ). Within businesses they outline a web of factors that are often intangible, but provide the backdrop to any change management process. 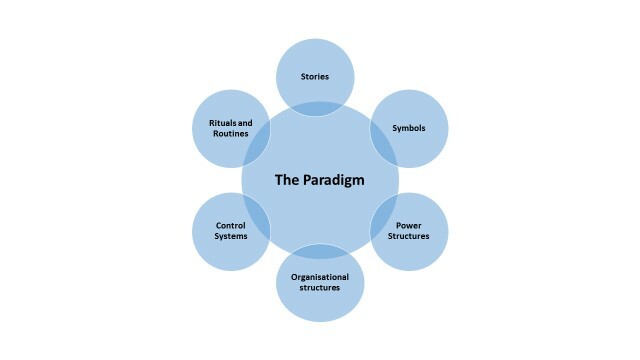 In the centre is the dominant paradigm, which is fed into through symbols, power structures, organisational structures, control systems, rituals and routines and stories. Our argument is that all organisations and industries have these elements, and that some industries and organisations have very strong cultural and even sub-cultural webs. It is the brokers’ responsibility to understand these. Take the humanitarian and ICT industries. Whether it is the stories of “silicon valley” or “silicon savannah” in the ICT industry, or the symbols of post-Rwanda, post-Asian Tsunami and post-Haiti responses causing angst in the humanitarian industry, evidence shows that both industries have strong cultural and sub-cultural webs. Anyone seeking to work on a partnership between organisations in these two industries needs to be aware of this in order to broker the proposed partnership effectively. To codify and simplify these cultures is a risky venture, and one that can never truly succeed in capturing the rich tapestry of their heterogeneous cultures and sub-cultures. However, there are a couple of models that can help brokers navigate these cultures, enabling them to provide more effective support for developing strong cross-sector partnerships. We have developed a couple of such frameworks, outlined below. 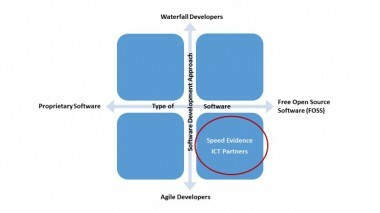 The first model, depicted in Diagram 2 below, shows only two of the many facets of the industry, but two that have a significant impact upon the behaviour of the potential ICT partner. 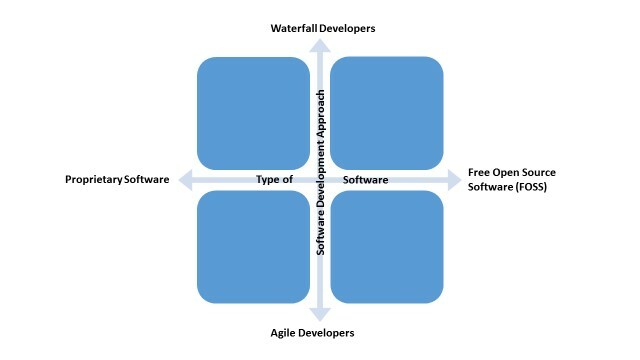 Software development generally falls somewhere between the more “traditional” waterfall and the newer agile approaches. Waterfall methods spend significant periods of time mapping out in great detail how the system will developed from end to end. The company will then build the entire system followed by some testing before it launches it as a “complete solution.” Agile development is more of an iterative approach that sees a “minimum viable product” developed using short sprints for coding and user testing as the software is built. Styles of work and approaches between the two types of developers are significantly different, which needs to be borne in mind when brokering. It will have a significant impact on how the ICT partners behave and approach the scoping and building and managing and maintaining quadrants of the partnership cycle. 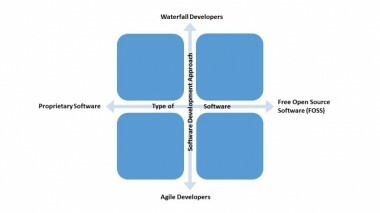 Waterfall developers will be used to significant scoping and planning as part of these phases, whereas agile developers are more inclined to quickly move into trying something small and seeing if it will work. If there are mismatches with their partner in these approaches, it can create tensions and frustrations. The type of software developed can be across the spectrum from proprietary for a commissioning business, to Free and Open Source Software (FOSS), which is open for anyone to use as part of a creative commons licence. There are numerous sub-cultures within the ICT industry, but there is a fundamental philosophical underpinning of FOSS-based development. FOSS developers generally believe in the freedom of information and value collaboration, as opposed to the more “traditional” proprietary developers, who are less collaborative,  and by definition closed. It is people who are engaged in FOSS development, or are philosophically supportive of it, who are predisposed towards volunteering their digital skills. If you understand where the software company you are working with is on that spectrum, it will give you an understanding of what their natural disposition and experience is likely to be in regards to collaboration and partnering. The three pillars concept is useful short hand to understand how the traditional humanitarian system works. These pillars are not exclusive, nor are they the entirety of the system where private sector, governments, armed forces, diaspora and individuals to name just a few of the other actors, all play various roles. However, the three pillars are the main backbone of the “official” humanitarian system. Diagram 3 shows a schematic of how those pillars are constructed in a simplified format. Within the NGOs there are differences between the strictly humanitarian NGOs, the multi-mandated NGOs that carry out development, humanitarian and advocacy work, and between INGOs and local NGOs. It is important to note, for instance, that a number of the UN agencies and ICRC/IFRC have specific legal  mandates that restrict their freedom of action in some circumstances. It is also worth noting that as UN bodies ultimately answer to member states, there is a tendency towards bureaucracy. Theoretically, therefore, organisations should become less bureaucratic and more nimble as you move from the top left of Diagram 3 – at the UN level – towards the bottom right of the diagram – at the local civil society level. However, although these differences are pronounced, in reality the headquarters (HQs) of the UN Agencies, IFRC/ICRC and the largest International Non-Governmental Organisations (INGOs) often behave more like each other than they do with their own organisational “field” offices. Conversely, the “field” office staff of the different pillars often have more in common with each other, than they do with their distant and increasingly corporatized HQs. The trend towards increasing centralisation of a number of the INGOs is exacerbating this. When brokering a partnership, it is, therefore, important to understand where the partner representative is located within the humanitarian system – it will provide an insight to the prevailing culture. This is particularly pertinent in developing ICT systems for these organisations, as the requirements of the different levels within the organisations vary drastically. It cannot be stated often enough, that organisations are not homogeneous. History is littered with partnerships that fell apart because they relied too heavily on one or two individuals, rather than on the partnership being properly embedded in the partner organisations. This is particularly relevant for humanitarian organisations. Due to the nature of their work, the key people working on the partnership could be deployed to a disaster response at short notice. And, because in many humanitarian organisations, there will be divergent views of what a technology partnership should be delivering, losing key people at short notice in such partnerships can have a significant impact. Brokers need to be mindful of this, and factor in mitigation steps to deal with it. Many of the insights above regarding brokering Humanitarian and Technology partnerships can be seen in a collaboration between three technology companies (Ushahidi, FrontlineSMS and SMAP) and World Vision (a Development and Relief INGO). The Speed Evidence  project was funded through the Humanitarian Innovation Fund (HIF). Speed Evidence is an information management system that creates a continuous real-time feedback loop between affected communities and responders after a disaster, with the aim of increasing the situational awareness of both by using appropriate mobile technology. Using the models articulated above, we can see where the partners fitted (Diagram 4). The INGO partner sat in the Civil Society pillar of the Humanitarian system. The partnership primarily engaged staff from the HQ and local levels. There had been significant engagement across the INGO on the first two steps of the partnering cycle. These steps were the scoping of needs and identifying the potential partners for the system. 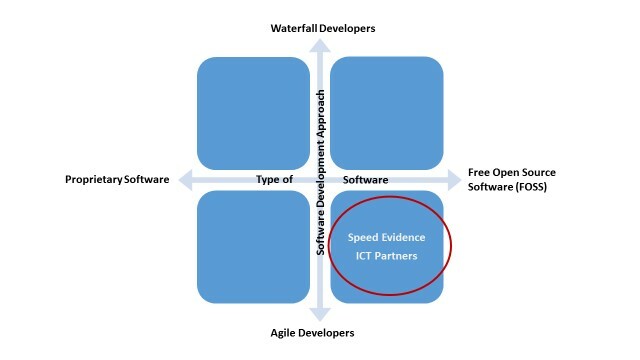 There were three different technology partners for the system, but they all worked in the same space within the software type and development style framework (Diagram 5). This meant that the conversations with each other were fairly easy and quick. There was much common ground, both in their philosophical positions regarding free open source software, but also in their ways of working, which were agile. The diagram below clearly shows this. Having mapped the partners on the frameworks, it is worth exploring the learning. In an effort to create a common understanding and roadmap for the project, the Speed Project team invited key stakeholders from each of the partner entities to a 3 day workshop. The partners were based in different parts of the globe, so this was a significant milestone. Initial conversations had been dotted with pre-conceived notions and assumptions. “My impression is that the challenge of these global ICT initiatives is that they become stuck trying to serve too many clients or widely varying requirements. So they get bogged down in defining and prioritising different requirements of very different user groups and ultimately compromising on all of them to get consensus and taking years to even do this at times. The resulting system becomes a race horse designed by committee, otherwise known as a camel.” – A Response Manager with years of experience including in Iraq, Tsunami Response & Haiti Earthquake response. The key breakthrough in addressing the assumptions was for the humanitarian staff to deliver a mini-emergency simulation exercise to demonstrate the complex nature of humanitarian responses with multiple stakeholders, a constantly evolving context and so on and to show how humanitarian responses by their nature have to be agile. This was a significant realisation for both groups. It was clear that working on a shared exercise as a preparatory step in the scoping and building phase of the partnering cycle worked as a tool due to it being an “agile” approach in and of itself i.e. test something instead of planning and talking about it. Using a tool and approach that aligned with the partners’ preferred working styles led to a positive outcome in overcoming the language and preconception issues. Frontline humanitarian staff and response managers often fear new initiatives between technology companies and their own INGO, and often for good reasons. The past 10-15 years of high profile humanitarian responses have seen several ICT ‘white elephants’ that were conceived as knee jerk partnerships between HQ and technology companies, triggered by the latter’s desire to do “something” to help. Often, field staff and affected communities were not consulted or if they were, their views were not fully taken on board. Therefore, when projects with ICT elements land on their desks in the midst of an emergency response, particularly in the initial phase of a humanitarian response, field staff tend to generally resist. “The absorptive capacity of responders is pretty low. It’s not because they do not have an affinity to technology. It’s because they are really, really busy 98% of the time, and they are sleeping the other 2%.” Robert Kirkpatrick, UN Global Pulse. In the face of resistance, ICT providers generally walk away from the partnership with a view that NGOs are not forward thinking or innovative and are bureaucratic institutions that do not adapt to 21st Century ways of working. NGO workers walk away with a generally dim view of ICT initiatives, thereby starting an unfortunate negative perception cycle. Again, this can be related back to the three pillars framework. Where previous partnerships have been forged just at HQ level, the partnerships have more often than not been failures. In contrast, the Speed Evidence partnership, by virtue of it being grounded in the experience of frontline staff, ensured it steered clear of previous partnership mistakes. Agreeing on the build, test, learn cycle with frontline staff was crucial for both the NGO as well as the technology providers to ensure that both the project and partnership worked well. Outcomes were that collaboration deepened, with joint trialling and joint problem solving throughout the course of the project. This approach made even the challenging discussions manageable. Throughout the project, the issue of decision-making turnaround times came up frequently especially from the private sector: in the author’s experience, this is probably the most consistent frustration expressed by companies in trying to partner with NGOs. Time and again the complaint is that decision making is long, protracted and “fuzzy.” The experience of the Speed Evidence partners was consistent with this. Although the staff who worked on the “coalface” of frontline disaster response were used to working in a nimble way, the mainstream organisational decision making systems and processes were those of a large bureaucratic HQ. This meant that there were significant time drags in making key decisions regarding the project. From the perspective of the ICT partners it would appear that the INGO was able to “talk” nimble, but was in reality slow and bureaucratic. There was a large contrast between moving nimbly within software development sprints that involved frontline staff, and getting decisions made at the stage gates of the project by decision makers at HQ level in the INGO. 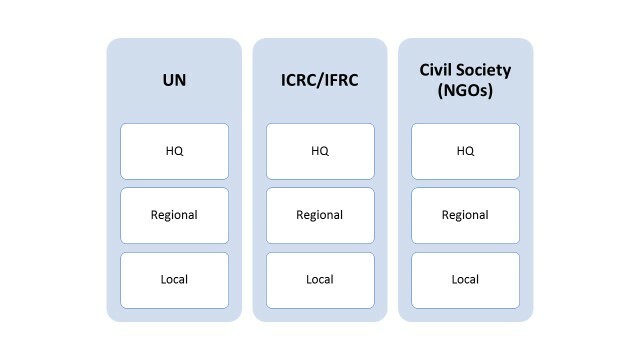 Again the three pillars framework can help build understanding of the decision paths within humanitarian organisations and hence manage the partners’ expectations. Partnership brokers involved in projects such as Speed Evidence and in collaborations between ICT and NGOs, need to be able to not only navigate the complexities of the two disparate groups but also to have an understanding of how the sub-cultures within each industry work. It simply isn’t enough to understand the immediate point of contact inside the organisation and their business need. An effective partnership broker needs to be able to appreciate the needs of the end users of any system. They also need to understand the skills and drivers of the ICT partners at different levels (developers, business analysts, business developers/project managers). This will enable them to understand and help the partners navigate the partnership effectively. In essence, the partnership broker needs to be a multi-span bridge. A person who can connect and bring together not just the partners, but the different layers and needs of stakeholders within each individual partner. The need for this bridging function will primarily be in the scoping and building stage of the partnership. The broker needs to be part anthropologist and part translator to play this function effectively. The models provided in this paper can help brokers achieve this, and provide solutions to the problems of “language,” “experience,” and “decision making” highlighted above. Ian Gray is founder and director of the consultancies Gray Dot Catalyst and Nex34. He has 15 years’ experience in the humanitarian sector, with the majority of that time in senior leadership positions. For the past number of years, Ian has been consulting and advising in the private and third sectors -primarily in the areas of strategy, innovation and strategic partnering. He has been at the forefront of a number of innovations, including Speed Evidence. Ian is a trained partnership broker, and has worked on all stages of the partnership cycle with numerous organisations on cross sector partnerships. He holds an M.A. (Hons), MSc (Econ) and MBA and has carried out work in over 20 countries and has lived in Africa, Australia and Europe. Madara Hettiarachchi is an Assistant Country Director at Concern Worldwide and is part of a global surge capacity team. She has spent the past 15 years working on development and humanitarian issues. For 5 years she was part of World Vision’s Global Rapid Response Team, providing technical assistance in the areas of planning, funding, implementing, monitoring & evaluation and implementing accountability systems in large-scale relief efforts. Madara was part of the Sri Lanka Tsunami Response, Myanmar Cyclone Nargis Response, Gaza Crisis Response, Haiti Earthquake Response, Pakistan Flood Response and Japan Earthquake/Tsunami Response. She has led Programmes; Design, Monitoring and Evaluation; and Accountability teams. Her most recent deployments were to the Philippines Typhoon Haiyan/Yolanda in November-December 2013, Iraq IDP Crisis response August 2014 (as part of an inter-agency team), and to South Central Somalia in November 2014. Madara has a particular interest in humanitarian information management and community engagement. She co-led the creation of the Speed Evidence project along with Ian Gray and project managed this HIF funded end-to-end ICT and business process system that enhances situational awareness to enable better decision making and two-way communication with affected communities. The UN Foundation, the Vodafone Foundation, OCHA and the Harvard Humanitarian Initiative. Disaster Relief 2.0: The Future of Information Sharing in Humanitarian Emergencies, pp. 8-9. http://www.unfoundation.org/assets/pdf/disaster-relief-20-report.pdf. Accessed 16/09/14. For more on this partnership see http://blog.standbytaskforce.com/tag/ocha/. Accessed 10/10/14. Johnson, G & Scholes, K, Whittington, R. (2011) Exploring Strategy Text and Cases, Ninth Edition, Pearson Education Ltd. Many Proprietary developers do use open source software as the base of many of their packages, and do contribute to the open source community, so the distinction is not black and white. In both hard and soft international law (lex lata and lex ferenda). Speed Evidence Project (www.Speedevidence.com) co-lead by Ian Gray and Madara Hettiarachchi, funded by the Humanitarian Innovation Fund and brought together 3 technology providers and a NGO – World Vision to enhance Crisis Information Management. To understand the full cycle of partnership brokering see http://partnershipbrokers.org/w/brokering/. Accessed 14/10/14. Multi-mandated organisations are generally built around processes for a development and advocacy business model. They use exceptions and special operational protocols to speed decision making processes up during a humanitarian response.